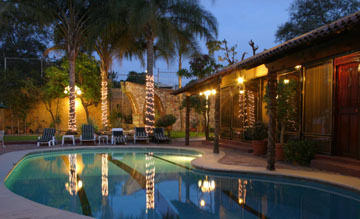 "An Oasis of Tranquility in the Heart of Tlaquepaque!" Whether on business or vacation, "QDJ" offers you a beautiful setting and unique personal service! Tlaquepaque, in the Guadalajara Metro Area, is Mexico's Arts & Crafts Capital and QDJ's excellent location puts you only steps away from it's superb shopping, galleries, museums, and inviting restaurants. & phone. We offer 18 rooms with private baths, cable TV, phone, air conditioning, and more. We have a full bar, tiled pool, bilingual staff, free Wi-Fi, and five star service! EVEN FREE AIRPORT OR BUS STATION PICK UP SERVICE WITH A 3-CONSECUTIVE NIGHT STAY! Standard: $85. 00 USD * Ample rooms with two full size beds and bathroom with shower. Deluxe: $95. 00 USD * Spacious rooms with a Queen, King or two Queen beds, beautifully tiled restrooms with bathtub and extra room amenities. 2-Bedroom Deluxe: $105. 00 USD * Poolside Suites: $110. 00 USD * Very large comfortable Suites each with a living room, King size bed and extra room amenities. Additional full size bed available. 2-Bedroom Poolside Loft Suite: $145. 00 USD * One private bedroom with a King size bed and restroom. A common double height living room/dinette area that opens to the pool & garden areas, kitchenette, a second restroom, and a loft bedroom with two twin beds. Master Suite: $150. 00 USD * Large Suite by central patio with a cozy livingroom fireplace, Jacuzzi for two, pink skylights, fluffy King size bed, 29" flatscreen Sony TV with Cable, DVD player, stereo, two remote controlled ceiling fans, ample Mexican tiled double vanity, towel warmer, and more! First night's lodging is kindly requested with confirmation. Deposit will be refunded if cancellation is received 14 days prior to date of arrival. If less than 14 days notice is received, the deposit is forfeited. We'll gladly e-mail a map with directions upon request. Main Bus Station is only 10 minutes away. Highway 15 runs one mile from Quinta Don Jose.